The game day countdown has begun and we have been looking over our menu choices for our game day spread. I want to make sure I have plenty of low carb option on the menu. Chicken wings are always a favorite food on game day, but drumsticks may be a better choice when it comes to feeding a crowd. 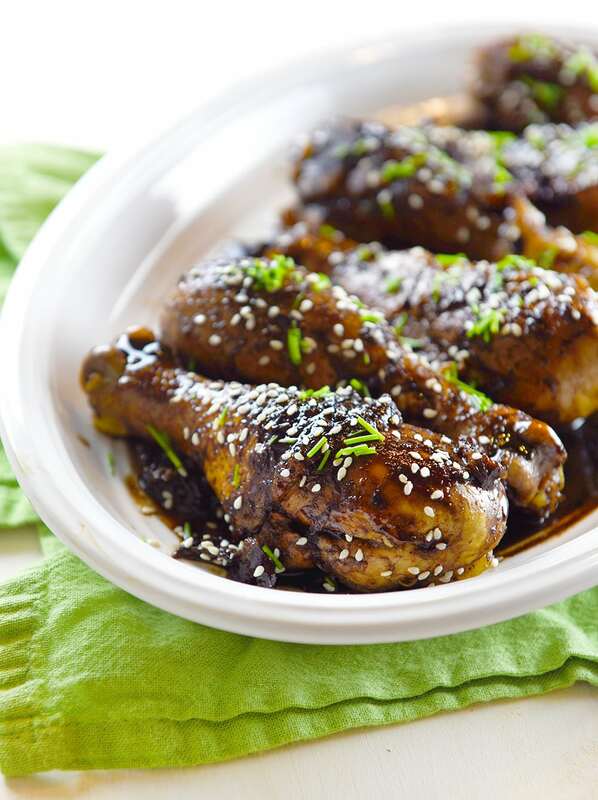 Drumsticks are bigger, have more meat, are typically cheaper per pound and are easier to serve. 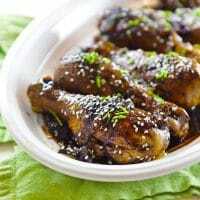 These Teriyaki Chicken Drumsticks taste amazing and are a great game day food. They also have a sweet and tangy sauce that only has only 6 grams of carbs total! 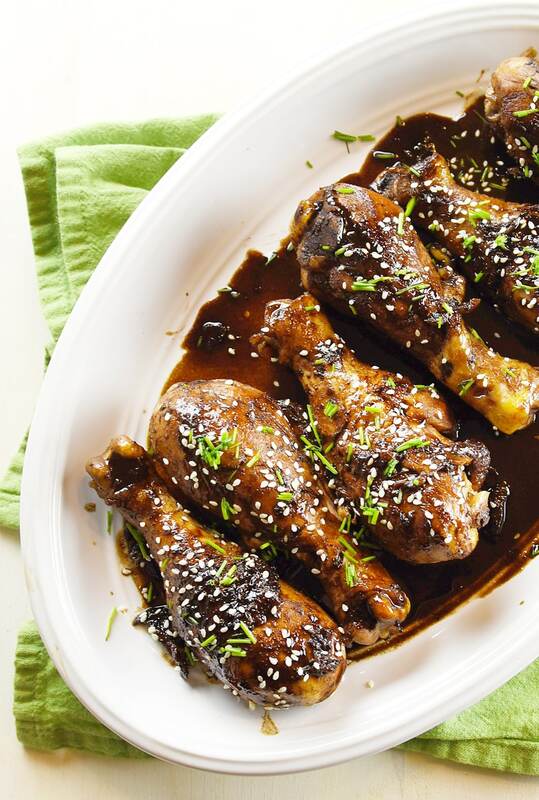 These drumsticks are certainly a favorite in our household. The balsamic vinegar gives it a great depth of taste and sweetness without being too sweet. Spray a large heavy skillet with cooking spray. Heat the skillet on medium high heat and add the chicken drumsticks to the pan. Brown the chicken on the outside for around 10 minutes or until the skin starts to become crispy. Meanwhile mix balsamic vinegar, soy sauce, honey and garlic in a small bowl. Once the chicken has browned on all sides add the mixture and reduce heat to low and cover skillet with a lid. Cook for at least 20 minutes or until the chicken has cooked throughly. Take lid off of the pan and turn the heat to high for around 5-8 minutes to reduce and thicken the sauce. The sauce will start to boil and become thicker and thicker. Make sure to cut off the heat before the sauce starts to burn. Take the chicken out onto a serving dish and pour the sauce on top. Sprinkle sesame seeds and chopped chives on top. There are many other yummy eats that are low carb for game day for those that follow the Atkins diet. The Atkins plan is a sustainable way of life for many because of low carb foods like cheese dip, veggies with ranch, cheese chips and Atkins sweet treats. 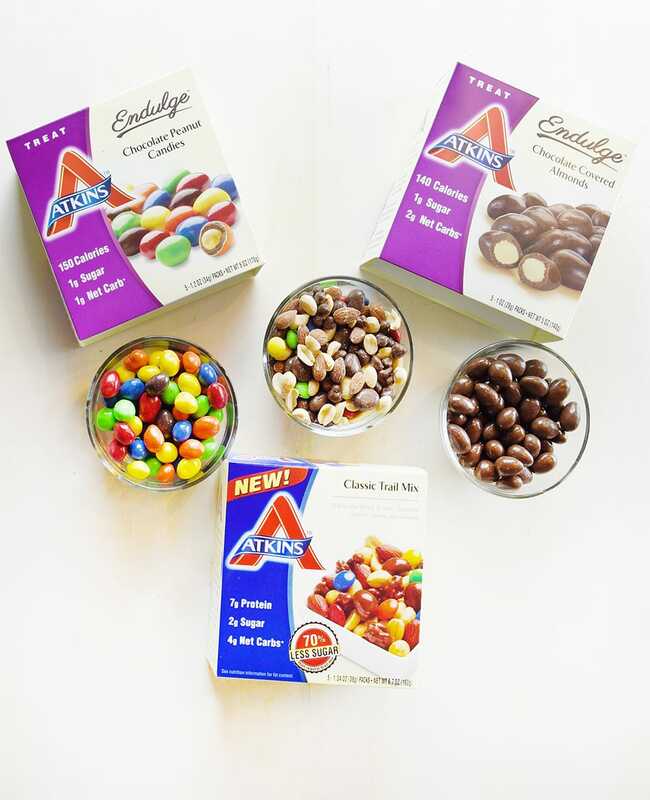 Atkins has many sweet treats like the Atkins Classic Trail Mix, Atkins Endulge Chocolate Peanut Candies, and Atkins Endulge Chocolate Covered Almonds. These would be great to serve at any game day party! What are your favorite foods for game day? You can see more low carb options on my Atkins #GameDaySpread Pinterest board. Be sure to also check out the Atkins #GameDaySpread Pinterest contest where you could win $200! Fine way of telling, and good piece of writing to obtain facts concerning my presentation focus, which i am going to present in academy. engage in visitors’ reviews like this. Should a position connected with guest writer become available at your end, i highly recommend you let me know.